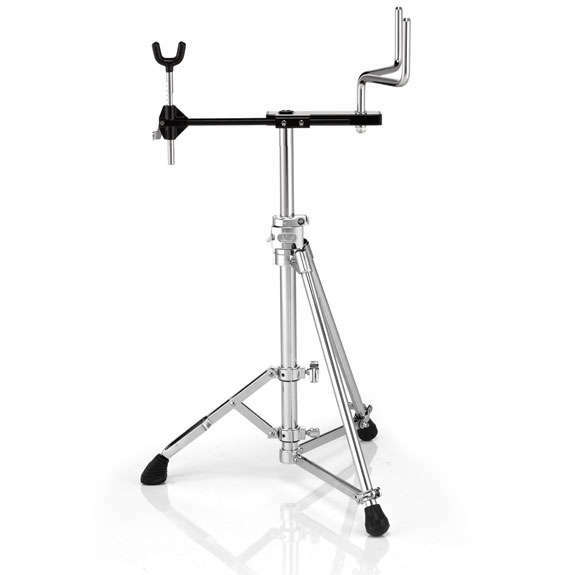 The Pearl MTS-3000 Advanced Marching Hardware Tenor Stand is designed by experts in making the world's most reliable percussion hardware with the world's most experienced contemporary marching percussionists. 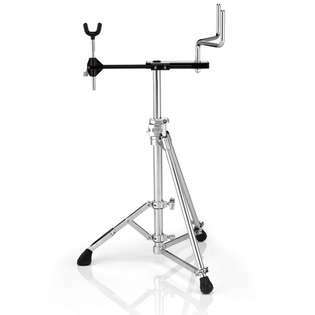 The MTS-3000 Marching Tenor Stand features a traveling front leg that allows up to 13 inches of adjustment for placement of the stand in the bleachers or on any unlevel surface and is also fully height adjustable. The stand also allows for angle adjustments to get your tenors right at the perfect angle. All adjustments to this stand can be made simply with your hand and a standard drum key. All-new for Pearl's MTS-3000 is the addition of an extending support arm. This support arm adds increased stability to the stand and will aid in preventing the backbar from bending and sagging. Simply slip the drums on to the two main posts via the backbar included with the CX Airframe or MX T-frame carrier and set the drums into the support arm and your drums are ready for hours and hours of playing on the most advanced hardware ever made by Pearl. Pearl's Shawn Lafrenz shows off the new Pearl Advanced Hardware System Marching Hardware with movable 3rd leg. Pearl just kills it with their products! This stand is literally perfect! They're very easy to set up and use, the support bar underneath that goes underneath the drums is easily adjustable and really helps prevent movement of the drums. You can be as aggressive as you want with the drums and they will stay completely still, just try not to break any drum heads ;) Definitely buy this stand if your tenors use J-rods to attach themselves to the carriers because it will not dissapoint! This was a Christmas present for our grandson who is in a drum line. It arrived on time with no damage. He loved it. Thank you. Just another reason why Pearl is the best reason to play drums. These stands are an absolute blessing for quad players. It's very simple to set up whether you are using it on flat ground, bumpy ground, or in bleachers. Putting on the drums is very easy and simple as well, using the J-rod system which is old-fashioned but very reliable, keeping the drums sturdy so they don't move around while playing. Very happy with this over the Yamaha stands which are plain annoying and don't serve their purpose. Let's go Pearl! Very easy to set up and use. Quality item.